Graceland University in Iowa has enough Hawaii talent to fill out a starting lineup and have a few players in reserve. 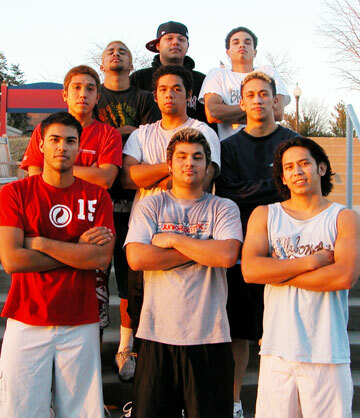 Front row, from the left, Clint Torres, Ian Woodward, Donan Cruz; Middle row, from left, Ryan Gonzales, Ainoa Miyashiro, Kekailoa Palea; Top row, from left, Ronson Olaso, Pono Yin, Allison Dupont. All except Palea played high school ball in Hawaii. Palea grew up in Washington state. Ainoa Miyashiro left Hawaii ... only to find Hawaii. The sophomore setter for Graceland University (Lamoni, Iowa) is joined on the varsity team by six other players from the islands and one on the junior varsity. "I left Hawaii, thinking I'd be experiencing new things and it didn't exactly happen that way," Miyashiro (Kamehameha '04) said. "I'm not sure that I'm disappointed or surprised with so many Hawaiians and players from Hawaii here. "For me, I was looking for an experience that would be different from home. Sometimes, practice is like an ILH match." But that's OK for Miyashiro, a second-generation college volleyball player and the second of three children of Joey and Gordon Miyashiro to play at the collegiate level. Ainoa's mother, Joey Akeo, was a two-time All-American during her career at Hawaii (1974-77); his older sister Tehani (Punahou '97) played for the Rainbow Wahine (1997-98) and younger sister Tamari (Kalani '05) redshirted this past season as a freshman on the NCAA champion Washington team. Although none of his Graceland teammates played with Miyashiro at Kamehameha, the "local style" of volleyball helped make his transition to the next level easier. The Yellowjackets finished sixth in the MidAmerica Men's Volleyball Intercollegiate Conference last season at 5-13, 12-15 overall. It was a disappointment for Miyashiro, who is used to success. He was a three-time All-State selection at Kamehameha, leading the Warriors to two state titles and a runner-up finish, and named an All-American at the 2003 Junior Olympics, where his ASICS team finished third. But things are looking up this season. The sixth-ranked Yellowjackets are 2-3 with a win over No. 5 Missouri Valley, a team that features Miyashiro's Kamehameha teammate Adam Tuifagu. "This year's team meshes better than last year, has better chemistry," Miyashiro said. "We've got four new players who have been pretty key to our success. "A lot of the Hawaii guys were last-minute additions and I was surprised to see some of them when I came back from (Christmas) break. But everybody's got a good attitude. "I have high expectations: making it to regionals, then to nationals. It's in our grasp. Every day is about focusing on our goal. Last year, we forgot about taking care of business, doing the things that would get us to where we want to go. Now we're doing it every day in order to get to the goal." Second-year coach Chad McDole has enjoyed the team's progress, tinged with an island flavor. "The Hawaii kids are fundamentally sound," he said. "They are fun to coach, and bring a unique bond to the team. The Hawaiians bring a spirit that we have embraced. 'Shoots, cuz,' 'Yeah, brah,' and 'Howzit, coach?' are just some of the lingo we hear from them. "They are some of the best players in the nation and we are committed to keeping Hawaii players very much a part of our tradition here at Graceland." McDole inherited the team from his father, who retired after the 2003 spring season. The younger McDole didn't meet some of the recruits until coming to the Junior Olympics that following summer. But the tradition of Hawaii players at the small Iowa school (enrollment 1,200) dates back to the 1990s with Bo Frank (Moanalua '92), who helped the Yellowjackets to the 1998 NAIA title. There's also a strong alumni group in Hawaii. "A few of our players recruited themselves," McDole said. "The core I started with, Allison Dupont (Pearl City '02) and Donan Cruz (Baldwin '01), helped recruit Pono Yin (Aiea '04), Ainoa and Clint Torres (Leilehua '02). "Ronson Olaso (Kamehameha '05) recruited himself. And Ryan Gonzales (Mililani '03) just fell in my lap. He could be the second-best libero in the NAIA and will be one of the best passers and defenders Graceland has ever had. Players have come based on recommendations from current players and through relationships they built with each other while playing with each other growing up." McDole also came to watch the Hawaii high school state tournament last November, saying he was very pleased with the entire experience. "It was the most productive recruiting trip I have made as a men's volleyball coach," McDole said. "The coaches, players and families were so receptive and appreciative for us coming out there to see them play. "For example I spoke with Peter Balding (Punahou) minutes after they won the state championship and scheduled a meeting with him the next day to talk about some of his players. What coach would give a college coach any of his time just after winning a state championship? He's a first-class guy who had the best interests of all the Hawaii boys at heart, even from other schools." At least one player from Hawaii has already committed to Graceland for next season. All-State selection Charles Bell from Kahuku gave a commitment last week. As for Miyashiro, McDole couldn't say enough. "He is an outstanding leader, cares about the team and is willing to keep his teammates accountable," McDole said. "He is very respectful, sweet, hard working and coachable ... not to mention a great setter. "He is about as ideal of a teammate as you can get. Our offense is structured around Ainoa and his ability to run a fast-tempo offense. We believe that is what is going to make us successful and a lot of that success rides on his shoulders. We are excited about our future this season." Miyashiro is already planning for his life beyond college and volleyball. This summer, the arts and education major will work the Yellowjackets' summer volleyball camp for girls -- Miyashiro was the assistant for the Graceland women's team last fall -- and work at a church camp (Graceland is affiliated with the Community of Christ). "I like it here," said Miyashiro, who wants to eventually teach at Kamehameha. "Adjustment-wise, it was pretty easy and I've made so many friends from other countries who go to school here. "The weather was an adjustment. Today was nice because there were parts of blue in the sky. We've had some snow and that is fun. Probably the biggest adjustment is to the food ... and I love to eat anything. I have discovered there are 40 different ways of making potatoes." Note: On the Graceland junior varsity is Ian Woodward (Maryknoll '03).